In our 10th year, federal marketers continue to have a reliable and affordable data source for honing and perfecting strategic marketing campaigns. Market Connections’ Federal Media and Marketing Study helps federal marketers reach the right senior decision-makers at civilian and defense agencies by providing key information about their media usage across print, broadcast, social and digital sources. Combining this with demographics including: job function, location, purchase area and more, marketers have the ability to slice and dice the data and map each to specific media habits, allowing them to target specific audiences. The survey represents the views of nearly 3,000 federal workers in a variety of position. Whether you are interested in a broad awareness campaign, or a more focused agency-based marketing effort, data from the study can provide you key insights about the media and marketing habits of this tough-to-reach federal market audience. Trusted Content – To what extent do decision makers trust news and information from different media sources? 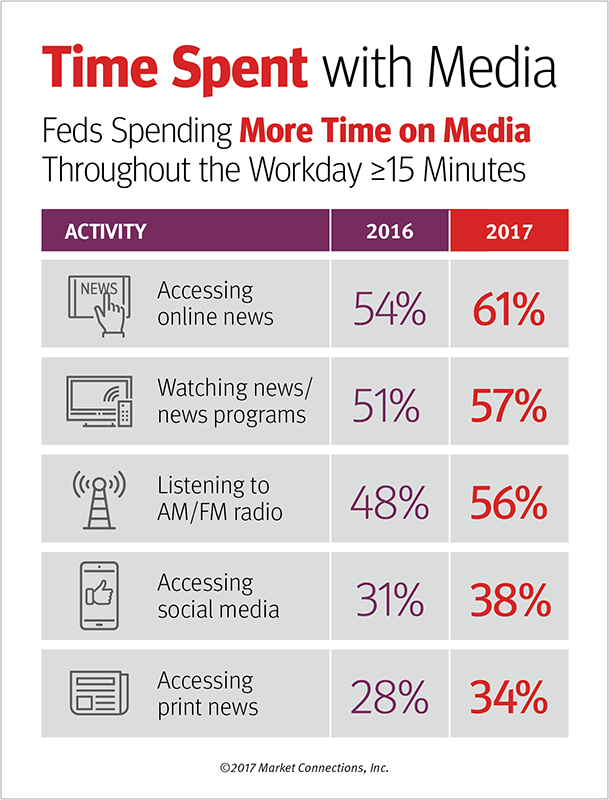 Time Spent Accessing Content – How much time do government employees spend accessing content online, watching TV, listening to the radio and reading e-newsletters? Confidence in News Reported by Media Sources – How confident are federal employees in the news reported by media sources? Work-related Advertising – Are federal employees seeing and clicking on work-related advertising seen in both their work and personal spaces? Expected Budgets – How do federal decision-makers feel their program budget will change in FY19? Smart Device Usage – With the growing number of smart devices, how fast are decision-makers adopting this new technology? Our NEW & IMPROVED Federal Media & Marketing dashboard allows you to cross-tabulate survey results to create your own customized data views, such as job title and product purchases; or job title and web site visits or publication readership. NOTE: You are purchasing a subscription to a dynamic online data set, not a PDF report. You will receive a user guide in the form of a PDF, and a representative from Market Connections will contact you within 48 hours with your username and password to access the online tool. AGENCIES: Please contact us for special pricing available for unlimited client usage. LEARN MORE ABOUT THE DASHBOARD, WATCH AN ONLINE DEMO, PREVIEW THE DASHBOARD’S CAPABILITIES AND SUBSCRIBE! How can this study help with your strategic marketing? Why is this study so unique? The 9th annual study combines actual media usage of mid- to senior-level federal decision-makers with their demographics, job function and purchasing habits. Survey responses from more than 3,000 decision-makers highlight their media usage spanning print, broadcast, social, mobile and online. Fake News – Do federal employees feel fake news has impacted the credibility of media publications? Teleworking – How often are federal employees teleworking and how does it impact media habits? Tenure and Retirement – Does the looming retirement wave impact how we should be marketing to federal decision makers? Commuting – What are the media habits of commuters inside the beltway?